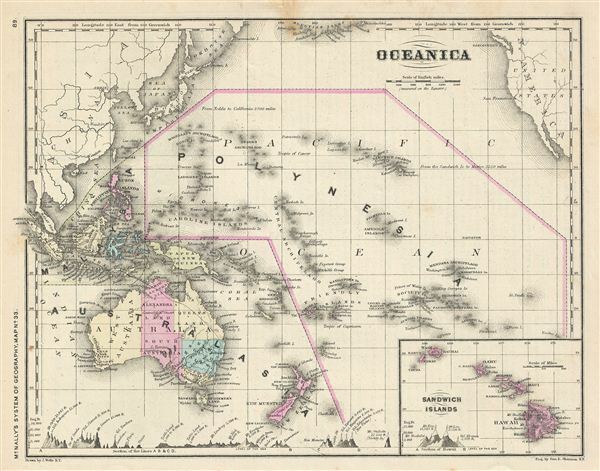 This is a beautiful example of Francis McNally's 1866 map of 'Oceanica' or the Pacific Ocean, including Australia and Polynesia. Covers the region in considerable detail with parts of North America and Asia included. extends as far north as the Aleutian Islands and as far south as New Zealand. Inset in the lower right quadrant depicts the Sandwich or Hawaiian Islands. This map depicts the continent of Australia with good detail along the coast and a largely unexplored interior. Various cities, towns, rivers and an assortment of additional topographical details are identified. Map is color coded according to political boundaries with elevation rendered by hachure. This map was issued as map no. 33 in McNally's System of Geography. McNally, F., An Improved System of Geography, 1866.